Video Bohemian: Who Needs North Korea When We Got The Republican Party. Who Needs North Korea When We Got The Republican Party. That's right. Seems North Korea wants to do everything they can to destroy the U.S.. They want to drop bombs on us, hack our emails, destroy our economy; yes, basically shut down our government. Well, judging from the activity of the Republican Party since returning from their summer break, they to too. Check it out: they want to imprecate the IRS on mysterious charges and have boasted that they will vote for impeachment of Hilary Clinton if she is elected president. So, now we see how Donald Trump made it to the top. 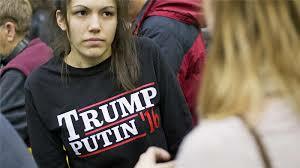 There's no doubt he's a Russian sympathizer who wants the same kind of control in the U.S. has Vladimir Putin has in his triumphant campaign to make Russia the Soviet Union again. It's a mess folks and if you are still voting Republican you should be arrested for unAmerican activities.